Converts VMware virtual disks (VMDKs) that are attached to a VMware virtual machine to a Microsoft virtual hard disks (VHDs) that can be uploaded to Windows Azure. Supports V2V conversions and of Linux-based guest operating systems from VMware hosts to Hyper-V hosts. Supports conversion of cold and powered off VMware virtual machines. Supports for the new virtual hard disk format (VHDX) when converting VMware virtual machines to Hyper-V in Windows Server® 2012 R2 and Windows Server 2012. Microsoft Virtual Machine Converter 2.0 (MVMC 2.0) also fixes numerous issues with crashing and conversion issues, when converting virtual to virtual computers to Microsoft Hyper-V. 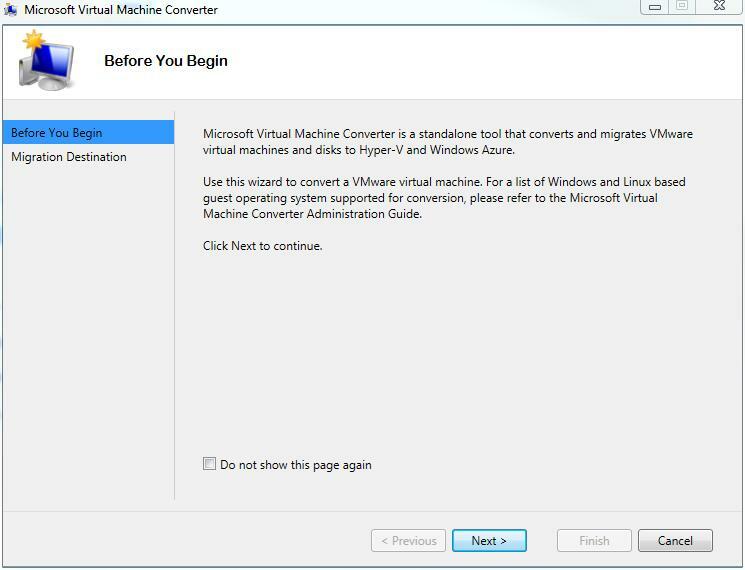 I would highly recommend the use of Microsoft Virtual Machine Converter 2.0 (MVMC 2.0) to migrate and convert VMware virtual machines to Hyper-V or Windows Azure, rather than the following older legacy conversion tools, which have been used previously.